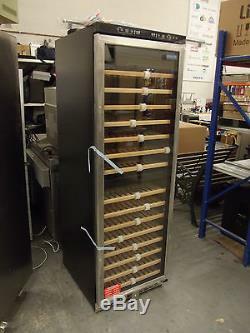 This is a Large capacity wine cabinet featuring two independently controlled temperature zones. Features an indicator LED showing unit is at correct temperature for sparkling, white or red wine storage. Cools and heats to maintain the perfect storage conditions. Dimensions - 595(w) x 680(d) x 1805(h) all mm The unit is new but has some minor cosmetic damage to the right hand side (see pictures). All items include 20% Vat. Collection is also welcome from our Kirkcaldy warehouse. 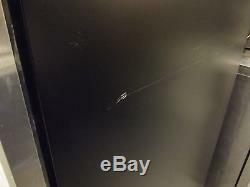 However the unit is unused aside from the cosmetic damage is in excellent condition. 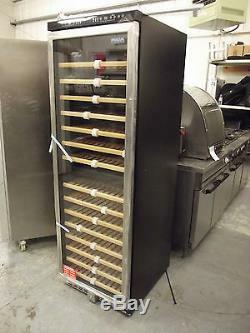 The item "Unused Dual Zone Wine Cooler 155 Bottles Commercial Refrigeration CE218" is in sale since Monday, December 1, 2014. This item is in the category "Business, Office & Industrial\Restaurant & Food Service\Refrigeration". The seller is "lovatscateringonline" and is located in Kirkcaldy, Fife.